A brief summary of each chapter is available here. All material on this page, with the exception of the figure, is Copyright 2014 Dawn Hill Adams, Ph.D. and Jo Belasco, Esq. Understanding the Horse LLC. All Rights Reserved. Copyright information for each figure shown here is provided through the full citations at the bottom of the page. The images should not be reproduced without crediting the original authors and publications in full. Full citations for these images, which are from research publications, are at the bottom of the page. These illustrations exemplify ones that we will need to secure permissions to reproduce, possibly paying royalties. This mock-up illustration from the Workbook shows you how to mark a photograph of you and your horse so you can more easily see how your horse is standing and moving. Once you understand what’s going on, it’s easier to feel it. 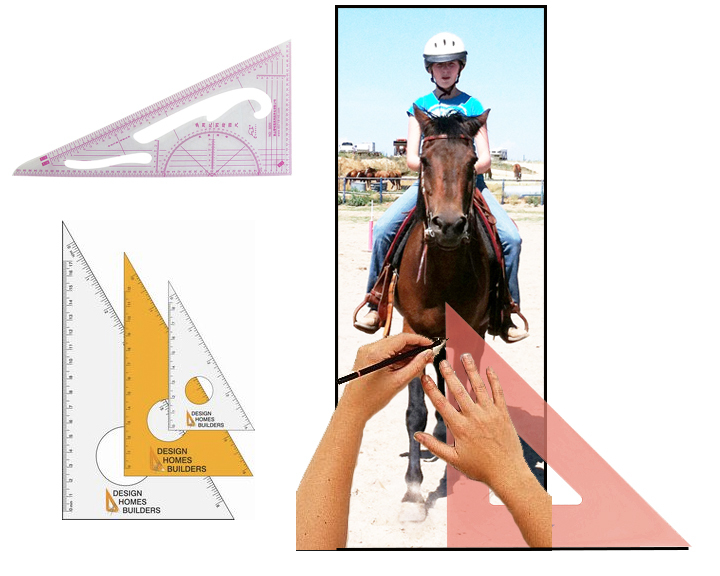 There will also be a free companion Workbook to “The Science of Riding with Feel: Horse Biomechanics and You.” Feel involves the rider’s body and the horse’s movement. Exercises keyed to each chapter of the book help develop better motion in your horse, perception in yourself, and communication between the two of you. Instructions on how to record and measure your horse’s movements allow you to better understand what is happening when you ride. This Workbook will be available online as a PDF for FREE download once the main book is published, with additional online videos posted to support and clarify the text and images. Citation informaton for the images shown in the figure on this page: The group of three images at the top is from Henry Chateau et al. 2009. 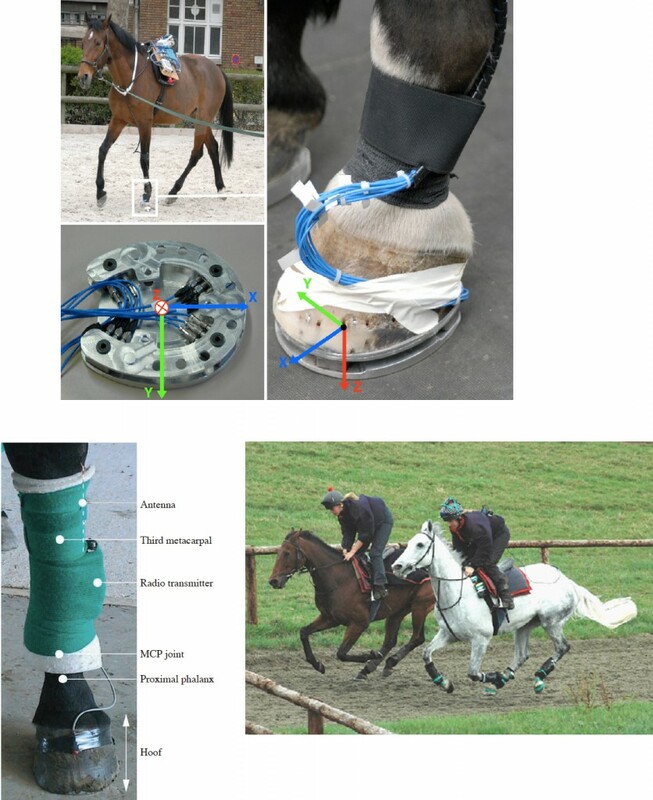 Design and validation of a dynamometric horseshoe for the measurement of three-dimensional ground reaction force on a moving horse. Journal of Biomechanics 42:336-340. Bottom left is from T. H. Witte et al. 2004. Determination of peak vertical ground reaction force from duty factor in the horse (Equus caballus). The Journal of Experimental Biology 207:3639-3648. Bottom right is from K.J. Parsons et al. 2008. High-speed gallop locomotion in the Thoroughbred racehorse. I. The effect of incline on stride parameters. The Journal of Experimental Biology 211:935-944.